Printer downtime and printing costs overheads can impact on profitability for many businesses. 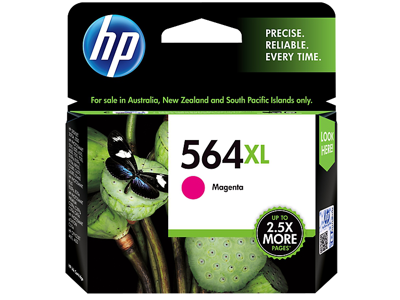 This impact can be significantly reduced with the genuine HP 564XL (CB324WA) Magenta Ink Cartridge long life cartridge. The higher capacity at a lower cost means that you keep printing longer at a reduced cost. Order your Magenta Ink Cartridges now from CartridgesDirect for prompt delivery. CartridgesDirect – we work harder to make your printing easier. Enjoy the value of exceptional printing performance—each Original HP ink cartridge is brand new. Print graphics with bright colors pop and rich black text. HP recommends ColorLok® paper for best printing results. Original HP Ink cartridges with HP Photo Papers deliver authentic colors for eye-popping photos. Versatile Original HP ink cartridges help meet your printing needs—from store-quality photos, to office documents, to web prints. Print easily and affordably with Original HP Ink cartridges that can be replaced one at a time as needed. footnote1 Based on paper-industry predictions for acid-free papers and Original HP inks; colorant stability data at room temperature based on similar systems tested per ISO 11798 and ISO 18909.
footnote2 Display-permanence rating by Wilhelm Imaging Research, Inc, and HP Image Permanence Lab. For details, visit http//:www.hp.com/go/printpermanence. footnote3 Compared to HP 564 Black and Color Ink Cartridges. footnote4 Program features and availability may vary by country. For more information, visit http://www.hp.com/learn/suresupply. footnote5 Tested in HP Photosmart D5460 Printer. Approximate average based on ISO/IEC 24711 or HP testing methodology and continuous printing. Actual yield varies considerably based on content of printed pages and other factors. For details see http://www.hp.com/go/learnaboutsupplies. Excellent service. Fast and reliable. Service was good but apparently I must have ordered the XL in the three coloured cartridges instead of the regular and I can't use them in my printer. Only can use the black XL. A little sad! <br>and they fitted into the printer very easily, and they are working fine! Good service. Will use again. Received four cartridges for replacement.Have not yet installed them.I feel they should be in order. Excellent service from cartridges direct next day delivery and if your not sure what to order you can speak to a customer service person and order over the phone . I have not used any of the ink cartridges i purchased from you as yet. I have no doubt that they will be most satisfactory as the other ones where that i purchaced from you. Thank you for your quick delivery. Excellent service. Easy ordering procedure and goods delivered promptly and in good order.